Held in the heart of Newark’s Lower Broadway neighborhood, Festival de la Familia celebrates our community’s vibrancy and diversity. Our cultural & musical street fair features carnival rides, games, performances by local musicians and community resources. Join us for a fun, and exciting day! The location is on Broadway, between Bloomfield Place and Broad Street. The event is free and open to the public. With an exciting Back to School theme, La Casa de Don Pedro is looking to give away 500 backpacks filled to the brim with school supplies to Newark School aged children at the 11th Annual Festival de la Familia, recently launching “Project Backpack! 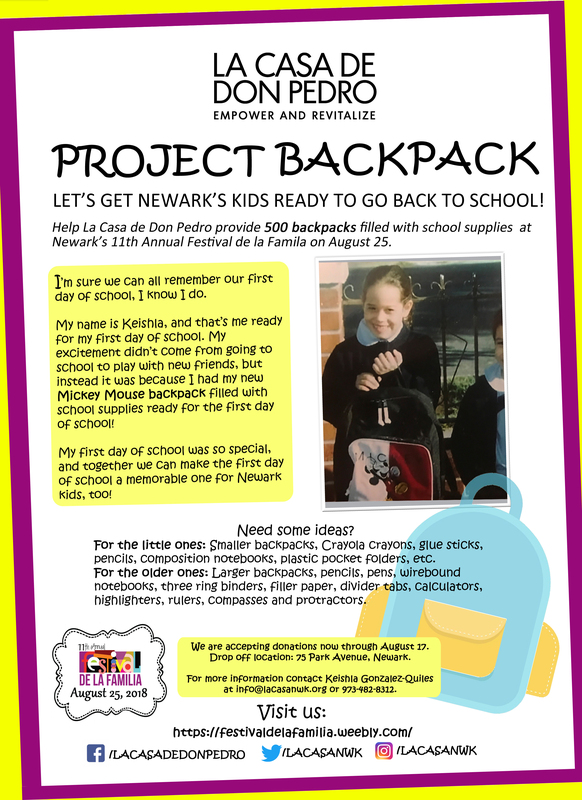 “Project Backpack” is La Casa de Don Pedro’s campaign seeking help to gather 500 backpacks and school supplies to be distributed to Newark children. With backpacks and school supplies for children in elementary to high school be sure to come down and get a backpack! Don't let the coming school year catch you unprepared, let La Casa de Don Pedro help to make the 2018/2019 school year a memorable one for Newark children! Join La Casa de Don Pedro and support our 2018 Special Events Series! Our four special events offer unique promotional opportunities targeting a variety of constituents. Events range from our traditional fundraiser that attracts high profile leaders, to celebrations that support our community’s rich cultural diversity and contribute to community health advocacy and outreach.